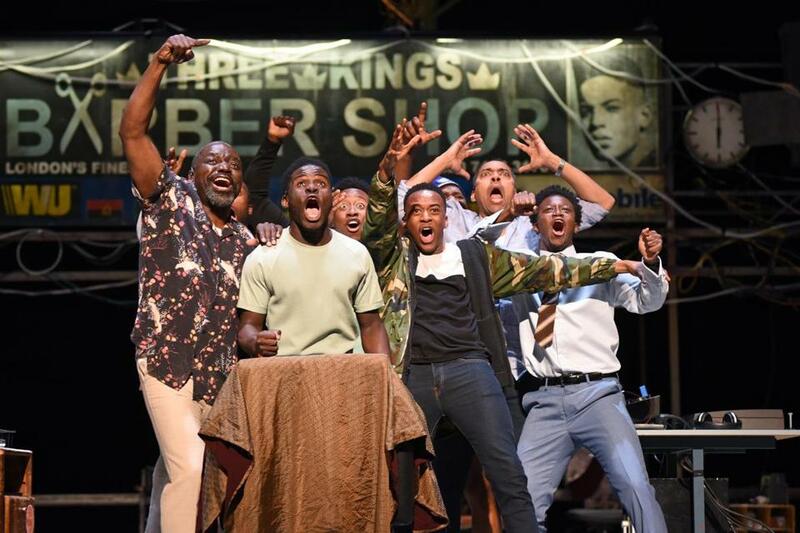 Playwright and poet Inua Ellams didn’t write “Barber Shop Chronicles.” He stole it. Ellams, who lives in London, crisscrossed the continent, eavesdropping in barbershops in South Africa, Ghana, Uganda, Zimbabwe, and his native Nigeria. The play, which comes to the American Repertory Theater’s Loeb Drama Center Dec. 5 to Jan. 5, moves back and forth from London to several African capitals, and the scenes are linked with music and dance that celebrate African culture and identity. A dozen actors play 30 characters who chatter and bicker while getting their hair shorn and their beards trimmed. The banter is seemingly casual, but as the play unfolds over the course of a single day, the men discuss such issues as the relationships between fathers and sons, masculinity, child abuse, and power. The men in Ellams’s play engage in similar debates, whether they’re expressing varying points of view about such African political figures as Nelson Mandela and Robert Mugabe or arguing over trivial matters like the difference between a sports fan and a mere supporter. Some of the men are adamant about their style preferences. One client wants an “aerodynamic” do. Another frets over an ingrown hair. One character expresses angst over the imminent birth of his first child. How, he wonders, does one act as a father? Another recalls his own father’s biting words: “I’m not your friend. I’m your father.” It could be a line from an August Wilson play.